1. Where did you get the idea for “Queen Up!”? Queen Up! had a slow incubation period that began before I even thought of writing the book. It was inspired by my experience recovering from a mild TBI from a car accident. Prior to the accident I had learned about living in connection with the elements as part of spiritual practice. I began applying the concept of aligning with specific elemental energies to figure out what the heck I was going to do with life after the accident when it became clear that there was no going back to what used to be ‘normal’ for me. I realized that others were facing similar before-and-after moments asking themselves the same questions I was asking myself. I began using the Tarot Queens in readings and then in coaching sessions to personify the elemental energies around and within us and knew I wanted to share this understanding with others. At first I was going to make it into a game, and then it became a party, and a workshop, and a coaching program before finally becoming a book. 2. In “Queen Up!” you use the four tarot queens. Do you feel like this could translate to the four tarot kings so men could “King Up!”? Queen Up! draws from my experience and the issues women commonly brought to readings and sessions, however that being said men are certainly welcome to read the book and utilize this system. The Queens represent archetypal and elemental energy and so even masculine energy is represented by the Queens of Swords and Wands. I would also recommend that men, or women interested in supporting the healing of the masculine in our society, read a book that addresses more of these issues specifically. One such book is King, Warrior, Magician, Lover by Robert Moore and Douglas Gillette. 3. 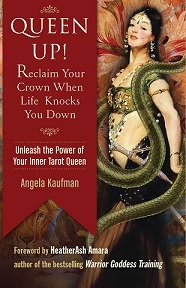 Do you have a favorite tarot deck for use with “Queen Up!”? My favorite deck that I have on hand most times for readings and work with clients is the Russian Tarot of St. Petersburg. When I am doing my own Queen Up! work I typically envision the Queens without using a specific deck, and it is my hope that this is what Queen Up! will jump start for others- the process of working with cards as a means to a more personal relationship with the archetypes. I also love the cards Shaheen created and have come to visualize these images many times when doing this work. I wanted Queen Up! to be eclectic however and so readers will find a variety of correspondences to various decks in the book so that it can be used in conjunction with any deck, or one of your own creating. 4. You offer beautiful companion cards by artist Shaheen Miro. How did that partnership come about? I LOVE Shaheen’s artwork!!!! One of the many awesome things about working with Red Wheel/Conari is that they have been fantastic and supportive every step of the way including an early decision to use unique artwork to portray the Queens. Kathryn Sky-Peck, the Editor from Conari, suggested Shaheen as she was familiar with his work. She said “he gets the archetypes, and I think you guys have a similar vision here.” I trusted her instincts and am glad I did. Not only did Shaheen do a phenomenal job but I am loving collaborations we have done since connecting. 5. The cards don’t come with the book, if readers are interested where can they find them? Queen Up! can be ordered as a kit via my website intuitiveangela.com, and as such will include the book, cards and a coupon on a follow up session. As there are only four Queen cards as opposed to a larger “deck” we decided it would make the most sense for the book to stand alone and the cards to be optional. Anyone who wishes to order the cards as an addition to a book purchased elsewhere can also e-mail me at intuitiveangela@gmail.com and I will be happy to provide details on ordering. Finally, cards and books will be available for sale at a number of book signings, workshops and other events taking place this spring and summer. 6. You run “Queen Up!” workshops. How do those differ from working through the book on your own? Working through the process with the book allows a personal unfolding to take place in your own time and at your own pace. It can be more personal because the focus is on your daily process and exploration of your transition, however there are several benefits to a workshop. One of course is the interaction and connection with others. By sharing the energy with a group you may develop insights you wouldn’t have come to on your own, plus you have the benefit of seeing that we share more in common with each other- including our common struggles, losses, pains and triumphs, than we may otherwise realize. A workshop can either be an introduction to the process which the book takes further, or a deepening of the work you’ve already started in the book. Either way the book has plenty of resources and exercises to create an ongoing practice of empowerment and transformation. 7. You also do coaching, what is that like? Coaching allows the best of both worlds. You can begin to work on the process on your own by reading the book, for example, but with coaching you have feedback, personalized guidance, accountability and guidance through the process. Programs are tailored to individual needs and support your specific goals. Some people are looking to heal and attract love, others want to make career changes, other people are going through complete personal shifts that touch every aspect of their lives. Coaching blends individual sessions with homework assignments, meditations and exercises like those found in the book, but with personalized direction. 8. If you could be any Queen, from the tarot, history, or fiction, who would it be? I love this question! I can’t pick just one though. Like the Queen of Wands, I want to try everything. From Tarot- the Queen of Pentacles because her energy is my least comfortable. From History, Queen Boudica, because it’s not whether you win or lose, but whether you have the courage to stand up to the Roman Empire. Fiction, Daenerys from Game of Thrones (though I shouldn’t speak so soon perhaps, not sure how the series ends)! 9. Do you have any upcoming projects our readers can look forward to? I have a few irons in the fire but not developed enough to leave hints just yet. For the next several months I am looking forward to spreading the word about Queen Up! through a variety of events in NY, New England and New Jersey (all the New places apparently) and playing around with fiction and poetry when the mood strikes me. Awesome! Thanks for the opportunity. What do you feel is the most important message or theme for readers right now? What would you like to see more writers in this genre focus on? Wow! High pressure question! I think an important message right now is to support one another. When we support and help each other succeed everyone benefits. I think a lot of writers, particularly in the new age and spirituality genres have addressed this for quite some time, but now is the time for everyone to embrace that message and put it into practice. Angela Kaufman is a Certified Intuitive Consultant, Psychic Medium, Intuitive Empowerment and Relationship Coach and LCSW. 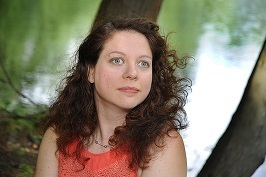 Angela’s mission is inspired by a lifelong interest in spirituality, metaphysics, Tarot, as well as a desire to challenge preconceived limitations. After a life changing accident, Angela left behind a blossoming career in Social Work to heal from a mild Traumatic Brain Injury. With an uncertain path ahead, Angela drew on her connection to Spirit to create a new, empowered and intuitively informed life. This would later become the basis for the Queen Up! system. 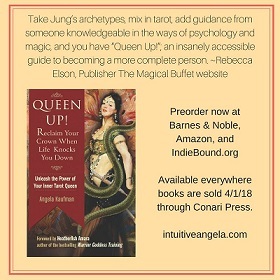 Angela is author of the upcoming book Queen Up! Reclaim Your Crown When Life Knocks You Down (Conari 2018), and has co-authored Wicca; What’s the Real Deal? Breaking Through the Misconceptions, Sacred Objects, Sacred Space; Everyday Tools for the Modern Day Witch, and The Esoteric Dream Book; Mastering the Magickal Symbolism of the Subconscious Mind (all with Dayna Winters and Patricial Gardner, Schiffer Publishing). She also writes short stories blending social criticism with spirituality, and is an artist and activist. Visit her at her website!